DC may not have local lemons. It may not have a growing season nearly as long as its sub-Mason-Dixon-Line location would suggest. But it does have beautiful spring produce, and it's out in all its glory for one precious month. (Isn’t it ironic, then, that just last week I discovered a great new way to prepare beets, and can’t stop, despite this being the moment to obsess over asparagus? Sigh. Beet recipe to come.) In last week's three-market crawl, I saw beautiful asparagus, but also ramps and strawberries, and even some first-of-the-season tomatoes. And of course, I also saw plenty of beautiful, red rhubarb. Suspend your disbelief that that the reddest rhubarb I found was $7/lb. That’s an obscene price. And no, I don’t think there’s anything wrong with being appalled at the price of farmers’ market produce; I’m not looking for $5 brisket, but just because it’s local and sustainable doesn’t mean I need to spend $20 to buy enough rhubarb for one pie. Off the soapbox: there are more reasonably priced stalks to be had. Last week I bought a big bunch from Dupont - I think from New Morning Farm – at roughly $4/lb, and earlier this week proceeded to make what is most certainly my new favorite way to use the stalks. I'm sure you're as surprised as I am that it involves like half a pound of butter. Sometimes, the world is cruel that way. A few extra laps at boot camp, and all that jazz. These bars are worth it. Let’s put a finer point on this. 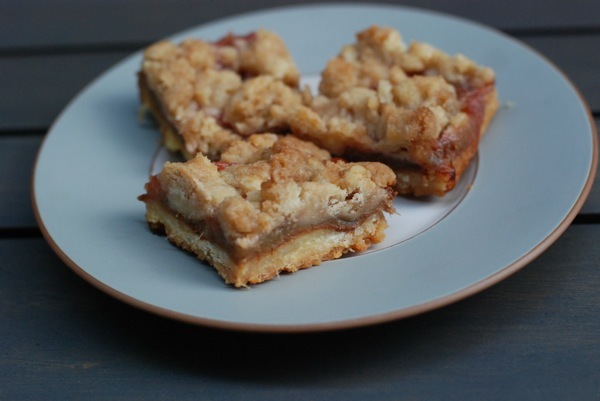 It's probably not surprising that when you combine a buttery shortbread crust, shards of good white chocolate, rhubarb cooked with whiskey, (yes, whiskey)and crunchy crumb topping, you end up with something you'd happily scarf by the pound if it had any nutritional value probably be willing to make again. But there is something surprising about these bars. It’s that white chocolate. See, it isn’t white. Not even close. More like deep camel-brown. That’s what happens when you stick it in the oven, stirring intermittently, for the better part of an hour. What was an innocent bar of sweet cocoa solids becomes creamy and smooth, deeply colored and textured, and nutty in fragrance and in taste – almost like really, really good almond butter. But way better. People, this stuff is liquid gold. Ever since discovering the recipe for caramelized white chocolate via David Lebovitz, I’ve not stopped playing with the stuff. 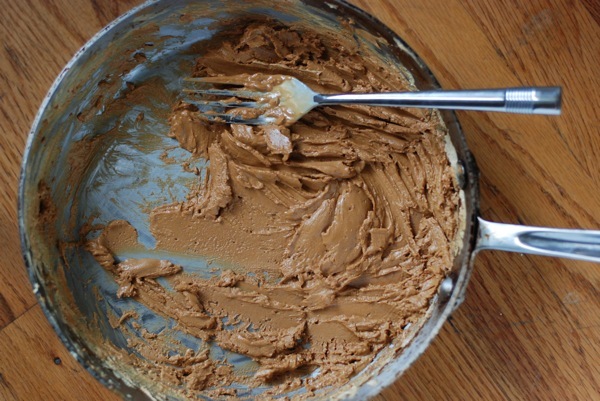 I’ve added it to cakes (as has he), spread it on toast, and eaten more than I care to admit straight out of the bowl. But this latest experiment really put it over the top. It’s a match made in heaven: the chocolate smoothes out rhubarb’s rough edges and deepens its flavor. It also conveniently insulates the shortbread crust from softening too much. The resulting recipe is something of a project, but worth the elbow grease and patience involved. Speaking of elbow grease: When you first remove the chocolate from the oven, especially at the later stages, it will look a bit crusty. Please don't fret. Just start stirring it, slowly but surely, and it will evolve from crystallized and chunky to ever-so-smooth. Just look at the photos below. If you’ve ever made and/or experimented with caramelized white chocolate, do share in the comments: what have you made? What’s been super delicious? What should I make next? I’ve got a little bowl of the stuff dangerously sitting around, and if I don’t act fast, well… you know what’ll happen. As I said, this recipe is a bit of a project, with so many different components. If you're not up for 4 different steps, feel free to skip caramelizing the white chocolate. One source of the idea to combine these flavors was a Bon Appetit recipe for a white chocolate rhubarb tart, and there, the white chocolate is just straight-up. I've no doubt the result will still be delicious. First, caramelize the white chocolate: I have found David Lebovitz's recipe to be pretty much fail-safe. He has you preheat the oven to 250°, put the chopped chocolate in a single layer on a baking sheet, and cook it for anywhere from 30-60 minutes, removing it at 10-minute intervals and stirring/spreading it around to redistribute the chocolate. Here's the link to the full recipe. That said, the last couple of times, I've actually done this on the stove. It's quite a bit riskier, because the chocolate can burn easily if you look away for even a second. That said, it takes only about 15 minutes to achieve thoroughly-caramelized chocolate, and there's something adrenaline-pumping about steering clear of the scorch while caramelizing something as delicate as white chocolate. If you want to try it, you'll need a heavy-bottomed metal pan, a fork, and a silicon spatula. Heat the stove to medium-low, and melt the chocolate. Now, begin stirring. Start with the spatula, but as the chocolate fully melts, then begins to caramelize, you'll need to switch to the fork. Stir regularly, scraping little bits from the side as you would if you were caramelizing sugar. You don't want any of the chocolate to touch the bottom of the pan for too long, or it'll scorch. I told you, it's risky. But fun! When your chocolate gets really stiff and/or begins to seize, remove it from the heat and stir vigorously. It'll calm down, and eventually, it'll return to its melty, delicious self. Repeat this on-off cycle for about 15 minutes, and eventually, you'll be rewarded with dark, caramelized white chocolate. Or just do it the fail safe way in the oven. Up to you. Caramelized white chocolate behaves like regular melted chocolate: it'll harden as it sits, but it can easily be reheated in a microwave or over low heat. Next, make the shortbread: Preheat the oven to 350°. In the bowl of a food processor or a stand mixer, combine flour, sugar, and salt, and blitz a couple times to combine. Add butter, and mix or process until dough comes together. Turn dough onto a lightly floured work surface, and using a light hand, turn it a few times to incorporate any errant bits. Line an 8x8 pan with parchment paper, and press the tart dough into the lined pan. Aim for a uniformly flat square; you don't want the dough to creep up the sides. Anchor the dough by poking it in several places with a fork, then bake it for about 20 minutes, until lightly golden. Remove from the oven and allow to cool. 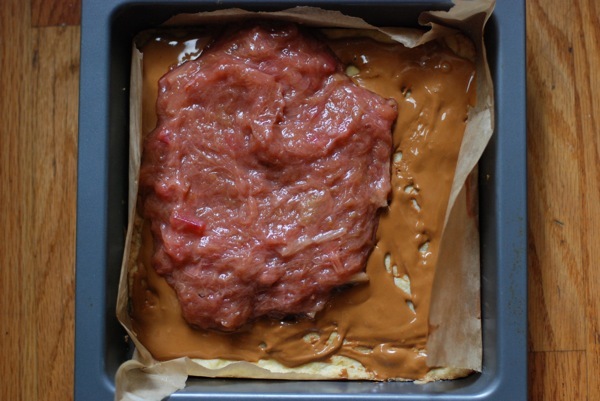 While the crust bakes, make the rhubarb filling: Combine rhubarb, sugar, and whiskey in a shallow saucepan and heat over medium until it starts to hiss. Cover pan and cook 6-8 minutes, until rhubarb is fully softened. Remove lid, raise heat to medium-high, and cook an additional minute or so, until juices evaporate. Stir rhubarb to break apart the individual pieces. You want the fruit to look uniformly blended, though it'll still have bits and strands in it, so it won't look smooth like a puree. Make the crumb topping: Combine all ingredients in a small bowl, and use your fingers to mix them together. Assemble and bake the bars: Spread the white chocolate over the shortbread crust, reheating it if it has solidified. Spread the rhubarb mixture over the chocolate, and sprinkle the crumb topping overtop. 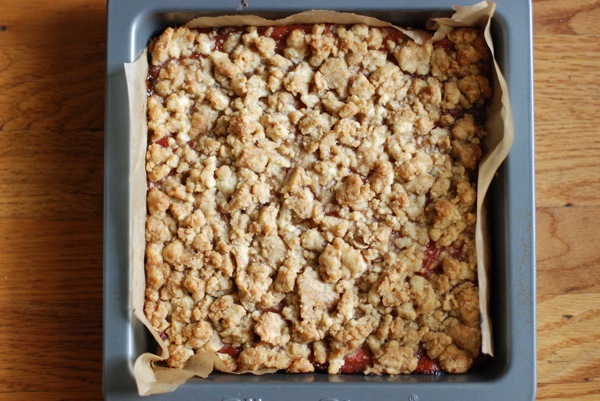 Bake for 50 minutes, until crumb topping is golden and rhubarb is sizzling underneath. Let cool at least 1 hour before slicing and serving.